Regardless of how one has become a single parent, Jo's wonderful testimony illustrates the difference Jesus made when He came into her life. A journey from the devastation of divorce and addiction to the positive and fresh hope she found in Him. Jo shares, with an honest and truthful heart, the ups and downs of single parenting. Alongside her own experience, she offers helpful practical advice she has gained through her career as a social worker and through her own spiritual life. An easy-to-read inspiration for all who walk the single parent journey. "As Jo's brother, over the years I have observed some of the struggles and joys spoken of in this book. As a pastor, I commend its message to you. Its early autobiographical chapters are compelling. Its later teaching chapters are informative and helpful. With the added uniqueness of the included father's perspective and daughter's story, this book is a valuable and fascinating read." "As Jo shares her real life story of being thrust into the role of single parent, her journey takes her from hopelessness to true hope when she finds God in the midst of her turmoil. 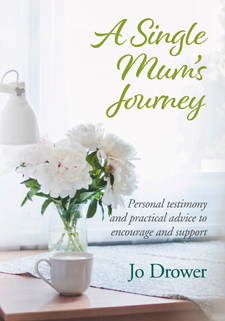 Jo weaves together helpful verses and practical tips, making this book a great resource for anyone who finds themselves looking for direction as a single parent. Be encouraged - life as a single mum is not an easy road but by the grace of God it can be done, and done well." Jo Drower is a qualified social worker and trained biblical counsellor. She is currently studying New Testament Greek and researching early church history for her next book.